Gentoo Linux 12.1 DVD (32-Bit) | Linux DVD Shop - UK Linux Shop supplying Linux on CD, DVD and USB with Free UK Delivery, 24Hr Dispatch. Gentoo Linux 12.1 is touted by Gentoo to be its greatest release ever. Gentoo Linux 12.1 includes KDE 4.8.1, Kernel 3.3, LibreOffice 3.5.1. 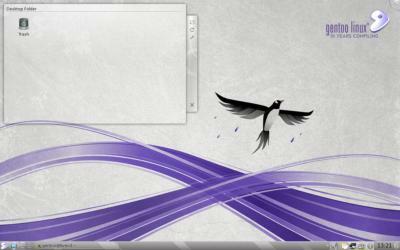 Gentoo is an educational and fun Linux distribution which can be a great way to teach yourself how Linux really works. Gentoo Linux is versatile and fast, it is a completely free Linux distribution geared towards developers and network professionals but used on many desktop computers worldwide. Unlike other distros, Gentoo Linux has an advanced package management system called Portage. Portage is a true ports system in the tradition of BSD ports, but is Python-based and sports a number of advanced features including dependencies, fine-grained package management, "fake" (OpenBSD-style) installs, safe unmerging, system profiles, virtual packages, config file management, and more.